The runes support the idea that Hel may rightfully be called the All-Mother. Hagalaz, the mother of all runes, is Hel's rune. Berkano, the rune of the Great Goddess, is a half-half form as is Hel. Commenter - "In your final slide, the upper map was Principle Component 1 which is consistent with the out of Africa Hypothesis, but the lower map - I'm wondering if that's Principal Component 2 ...?" Evolutionary geneticist Richard Lewontin - "It is." Commenter - "... and I'm wondering that because there's a line across Africa at the Sahara, there's a line across Eurasia at the Urals, and that would seem to suggest that the primary signal of human genetics is out of Africa and the colonization of the planet, but the next strongest signal is the regional differentiation?" Lewontin - "Absolutely, you're quite right about that." So, PCA 1 represents combined genetic elements corresponding to the movement of homo sapiens out of Africa, while PCA 2 represents combined genetic elements corresponding to the differentiation of regional populations of homo sapiens. 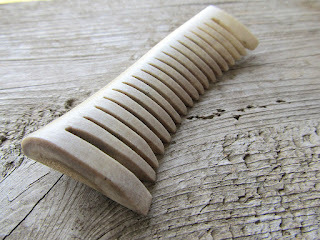 My hand carved deer antler magical comb. This is my hand carved magical comb. 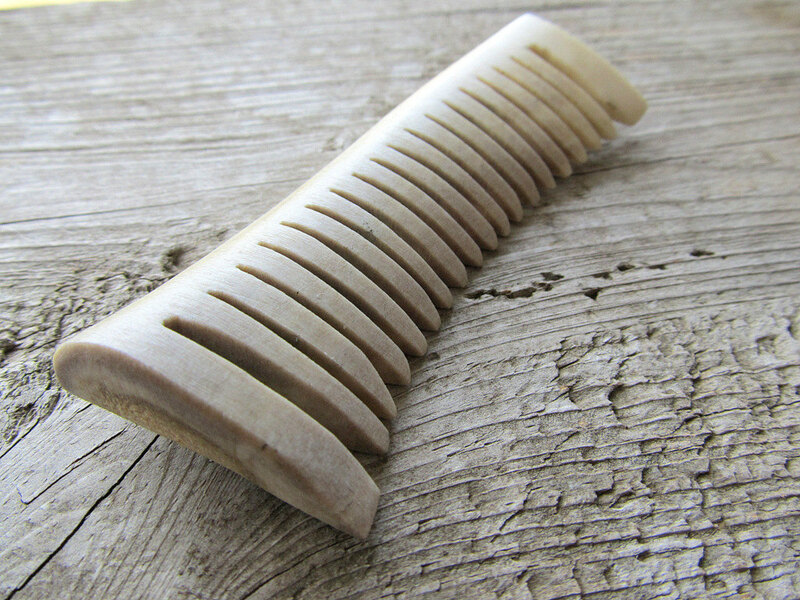 Made of genuine naturally shed whitetail deer antler (in honor of my Scandinavian U5b1b1-T16192C! genetic motherline), I will soon be ritually risting my own runes into it. I haven't decided what runes I'm going to inscribe yet - I will likely not post that either. May my family's hamingja be strengthened, be our might and main increased! In follow-up to my previous post (Voces Mysticae - ᛗᚹᚨ), this post records the dream and astral experiences surrounding the reception of this 3-rune phonetic phrase. I woke up very early this morning before sunrise to the sound of my mother getting ready for work in the bathroom on the other side of the wall against which my bed is situated. I fell back 'asleep', sort of. Suddenly, I was in my astral body, outside in the front yard near the road which runs in front of our rural home. It was dark outside. I noticed that the row of hedge [haag?] trees was not there as it is now, but the yard looked as it did when I was a little girl when all the neighborhood kids (myself included) would play a hiding game, 'hiding' from cars coming down the road at night with their lights on - we would drop down into the deep ditch which ran parallel to the rural road which ran east-west, sitting north of the property. A car with its lights on was coming down the road from the east going west, I didn't drop down into the ditch - I remained floating in midair ('flying' in my astral body), caught in the light of the car's headlights as it approached. I wondered if the occupants of the car could see me in my astral body. 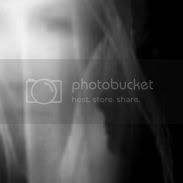 They didn't seem to at all, as the car continued along its merry way, not slowing down nor doing anything to indicate that the driver could see my 'ghostly' form or anything unusual. The car passed, and suddenly again, I saw a fog approaching across the road. It wasn't a desirable thing to be overcome by the approaching fog [Niflheimr? ], so I went back towards the house to return to my body. Then things changed again, nothing was oriented as it was supposed to be to make navigating my way back to where my body lay easy. The road was now south of the house, windows were mismatched to their actual locations. As an astral being, I got caught by some kind of metal gripping contraption where a tv antennae used to be on the west wall of the house which was also a bit out of its place. Though I struggled, I couldn't get loose of its grip. Suddenly, I looked up toward my own bedroom window where inside, a belled pentacle [femsteor] wind chime hung - through it light streamed toward me - I was immediately released from the contraption's grip and woke up back inside my body. I heard my mother in the bathroom drying her hair with her hair dryer. I began to drift off again, but before I did, I 'saw' an ancient Viking 'drop down' into my world into my room. I drifted off to sleep. There was a Viking raid in my ancient village. I'm not sure if I was a native of the particular village or not - I'm inclined to think probably not as I don't really recall that kind of emotional connection in the dream. Vikings were all over the village. I was trying to find a place to hide, but still out in the open, one Viking saw me. Everyone in the village was killed in the raid but me. I was captured by the Viking who had 'dropped down' as I had drifted off to sleep. He had decided to keep me - I became his captive bride, although I soon came to love him - he treated me well and loved me. ... hearing the cacophony [ancestral Voice of the Many as described in Celtic mystical tradition] was pretty common for me about two decades ago, the commanding male voice was common about a decade ago. Now, I don't have either experience much anymore. I used to "see" runes and other magical letters/symbols written in the inky black darkness around me in the room alot about a decade ago too. Once in awhile I'll hear a discussion between two people, and even occasionally, I'd hear a group talking - like discussing me in a small meeting - sometimes their discussion was along the lines of "should we tell her?" "is this a good idea?" and so on, as if a group of beings were discussing amongst themselves just how much should be revealed to me by the main male communicator who I would hear more directly. Mostly, I'd just hear the commanding male, but like I said, a few times, he'd open up the veil for me to hear what else was going on around me - like the conversation of the small group discussing me. Also, many times, it wouldn't be my name I would hear, it would be a "magical phrase" (for lack of a better term) - words not in any language I'd ever learned and I'd often have to decipher the meaning using the meaning of the letters and syllables as I understood them. These mystery phrases became more common than hearing my name. In the study of such formulas among Classicists and Egyptologists the idea that the voces mysticae were mere nonsense or gibberish has been once and for all rejected. By applying some of the same anthropological research as I used in Runes & Magic (1986), Gager concludes that the voces mysticae are forms of precise communication with beings of a higher order than man. Furthermore he points out that "the use of unintelligible forms of speech ... signaled the passage from the lower mundane realms to the sphere of true spiritual conversation with higher orders of being (Gager 1992, 9-10)." - source, Jelling Runes: Fifth International Symposium on Runes & Runic Inscriptions, page 77-78. Evidence seems to indicate that the Germanic rune-masters, and more especially the self-designated Erulians, were concerned with the same problems of language and symbolism as were the Mediterranean creators of lead tablets, amulets, phylacteries and magical papyri." So, I’ll conclude with the original question, are the Einherjar necessarily Eurlians? The answer would seem to be no. A warrior may have been chosen for his valor or distinction in battle and not his runic knowledge, not all warriors had this knowledge, and obviously not all warriors were chosen. But what of the Erulian ~ Rune Master? By their very nature, the runic warrior, does battle with elements seen and unseen, in all the worlds. By this virtue they secure for themselves a place at the table in Valhalla. source - Einherjar or Erulian, A Study of How One Arrives at the Table in Valhalla. Taking all of these little bits together, it's not so inconceivable that the conversations I heard as described above in my experiences (all within the proximal context of seeing runes and other symbols in the inky blackness of the night around me) were conversations taking place in Valhalla among a group of the Einherjar, perhaps among an Einherjar-Erulian rune-master and other Einherjar - and important to me personally - I heard them! in Valhalla! I'm ecstatic! And now I'm even more set on wanting the 13th warrior prayer said over me at my funeral when I pass over! Where the brave, they live forever. As those who read my blog may recall, I recently ordered my own set of underworld Dreampower divination cards following my first exposure to them during a Druidic Samhain ancestor offering ritual. Well, my own set arrived! This is my very first reading on myself using them. First card in the Stone Realm (the realm closest to the surface) reveals one's personal story, family or true career work, opportunities, health/body and surface life. Also shows inherited patterns, knots and repetitive spirals from early life and previous lives. I drew the Ace of Fire. 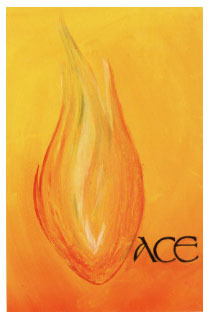 The Ace of Fire is the originative vibrant power of burning brilliant illumination. 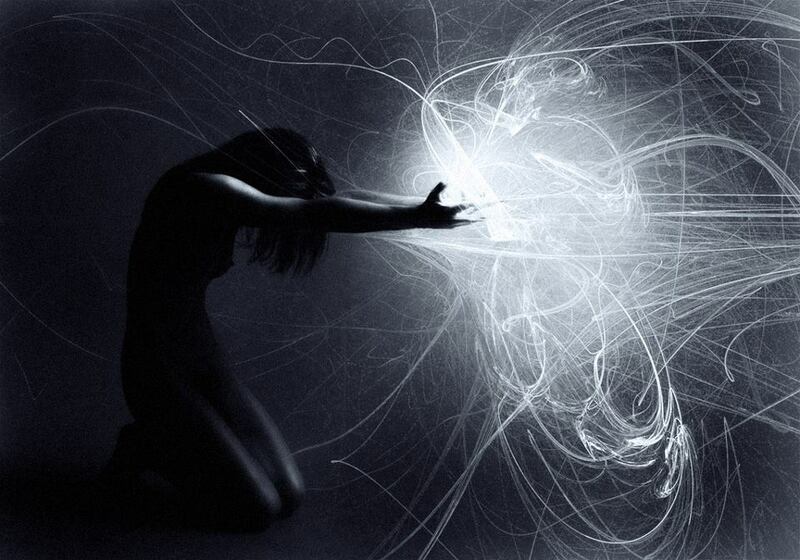 It is the Spark, ignited and aroused. Appearing in the Stone realm, it is very close to me, Heid, the Bright One. Just under the surface of normative awareness, it burns with a burning red and gold background embracing the central flame. A perfect draw in complete harmony with my Sacred Teutonic Name. Second card in the Pearl Realm reveals inner life, inner hidden heart, the light of midnight, personal inner truth, creativity, and the energy that flows through inherited patterns. These patterns open, untie the knotted bundled information to bring liberation, reveal knowledge and transmit mysteries. I drew the 7 of Fire. The 7 of Fire is Response, Feeling, Intuitiveness - these things imply conscious apprehension of the inherited patterns ignited and burning as noted in the Stone Realm. Moreover, the 7 of Fire in the Pearl Realm indicates that this conscious apprehension flows with creative energy and esoteric inherited ancestral knowledge - my birthright, my ancestral wisdom. My conscious awareness, through this divination reading, touches and reclaims this deep ancestral wisdom as my own. I claim my birthright. The number 7 in many mystery systems pertains to spiritual completeness and perfection. Third card in the Whirlpool Realm reveals the life of the spirit, the reality of Being, the source of many outer lives, reflects the deepest potential, and carries inherent stellar power of the universe within the individual. I drew The Whirlpool, the trump in its natural realm. 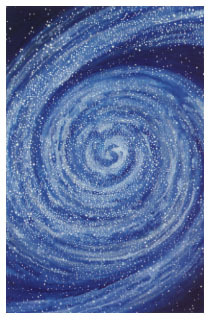 The Whirlpool in its natural realm pertains to Star Consciousness, connection to Universal power and stellar consciousness. 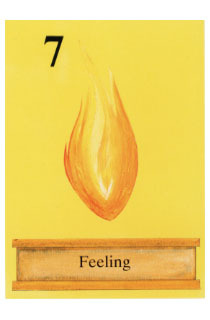 In a reading this card reveals subtle far-reaching energies beginning to surface into and permeate life. Taken together with the first two cards, what is beginning to surface and become known in my life is conscious intuitive apprehension of inherited ancestral knowledge, unfolding into an illuminating creative flowing energy from my deepest Source of Being into my everyday mundane reality. How awesome! So mote it be! Following creation and incubation in the Stone Realm, and pre-manifest revelation in the Pearl Realm, we now come to the threshold of manifestation in the Whirlpool Realm. It is here in the Whirlpool where chaos creates manifest reality. In a state of unity, quantum mechanics tells us that energy (from which everything is made) can be in many places simultaneously. It is through chaos that potentialities decohere into being one thing over fuzzily existing as everything - in other words, all possibilities collapse into a single definite something. In our reading, the Tangler sits in the Whirlpool. 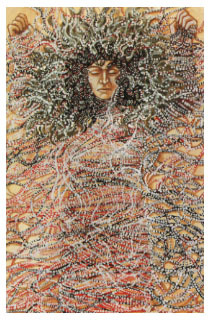 The Tangler is a male figure, wrapped in many strands of white, red and black. The energy coming through is active (male) and it is embraced by the protective threads of wyrd weaving into manifest reality. like the bed of moss in my offering to the Ancestors. The strands of red, white and black are tangled then braided into his locks, set with many tiny pearls. The strands of wyrd are weaving into the realities of all in the group (a single something consisting of) pearls of deep ancestral healing wisdom and memory (as uttered by the Teller in the previous card) for each of us. This an AWESOME Samhain configuration and divination. We have indeed been blessed! Hail the Might Ancestors, hail the land wights, hail Frigga, hail Freyja and hail Hela! In my first experience with Dreampower Divination, the first card from the previous post pertaining to the Stone Realm can be likened to the darkness and lunar shadows, hiddeness, and to the womb where enlightened communication is sourced. 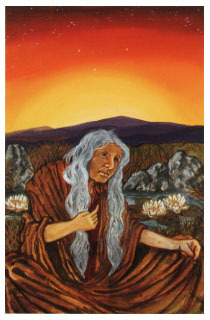 communicates ancestral memories to you; these may include recovery of part lives, your own or those of others. How very encouraging and affirming to me that my offering to my Ancestors has been, not only accepted, but that the Ancestors will grant my request - a gift in acknowledgment of the gift of the Soul Retrieval oil, specifically. My Ancestors will aid me (and all involved in the group reading) in my (our) work to recover and heal the deep wounds of my (our) soul (folksoul). Not only has the Teller told me so, but the Teller has uttered it with the Voice of One into my (our) reality. Hail the Mighty Ancestors, the land spirits, Frigga, Freyja and Hela! I attended my first pagan group ritual with the ADF (Druid) in a nearby town. The Samhain ritual we did to honor and give offerings to our ancestors was led by a woman who is also involved with Northern Tradition practices (and Seidr), as our ritual very closely resembled a blot to the ancestors (which I really loved). In my mind, the Stone Realm pertains to the deep place of prophetic utterance, of the Ancestral Voices, and to a state of consciousness where the Voices of the Ancestors can be perceived as the Voices of the Many, the Voices of the Few, or the Voice of One which R. J. Stewart distinguishes as conditions of being. The card drawn for this realm therefore, speaks to which state of consciousness is operational to each "hearer" in the reading. The Choir is a group of assorted animals singing loudly. We see a donkey, cow, sheep, pig, goose, cockerel and duck. There is a cat playing the bagpipe. 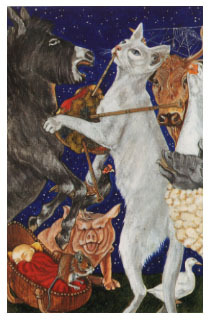 Within this cluster of animals, all leaning onto one another, extending their necks and singing loudly in harmony, we also see some small creatures: a mouse listening raptly, a spider within her web spun between the horns of the cow and in one corner a small baby sleeping peacefully in a wooden cradle. This Trump works on several levels and we may use our overall idea of the Three Realms resonating through each card (with each Trump at home in one particular Realm) to examine the levels. As some who read my Facebook may recall, I recently learned from my father that my paternal line hails from the Cumberland Gap in Appalachia, making it very likely that some of my paternal grandmothers were Appalachian root workers known as granny witches, and practitioners of ethnic Appalachian folk magic. Pre-statehood settlers of Kentucky were mostly of English, German and Ulster Scots descent who migrated from the Atlantic seaboard states. Immigrants from North Carolina and southwestern Virginia came by way of the Cumberland Gap and over the Wilderness Road. Immigrants from Maryland and Pennsylvania came on flatboats and rafts down the Ohio River from Pittsburgh. Other early immigrants included small groups of French, Swiss, and Welsh. During the mid-19th century the Ohio River brought many German immigrants and settlers from New England and the Middle Atlantic states. Many Irish settled in Louisville during this time. In 1790, historians estimate Kentucky's population was English (52%), Scots-Irish or Scots (25%), Irish (9%), Welsh, (7%), German (5%), French (2%), Dutch (1%), and Swedish (0.2%) in ethnicity. 1820 statistics vary slightly: English (57%), Scots-Irish or Scots (18%), Welsh (9%), Irish (8%), German (6%), French (2%), Dutch (1%), and Swedish (0.2%). Native Americans were the indigenous population also living in the area with the immigrants, giving support to the oral family tradition of having some Native American family members. As a small child, I grew up around one aunt known to be a full blooded Cherokee. She was known by the name Palace. The clannish rural area I grew up in (often humorously called Taylorville - my birth surname is Taylor) was one in which many families in my father's extended family lived in homes and properties clustered together in proximal concentration. Even today, several families of the Taylor Clan still live here in proximally clustered homes. This clannish way of living, also fits well with ethnic Appalachian ways of living. No one in my family has, in oral family tradition, ever been Catholic Christian - I was raised as a Protestant Christian (where Protestantism in my mind is the first major successful impulse of the Teutonic folksoul to return to its native Pagan roots, and to throw off the yoke of the non-native religiosity imposed on the people via the Romanization of Pagan Europe). The religious affiliation of Appalachia with folkish Protestantism also fits with the ethnic and religious history of Appalachia and the oral traditions coming from my paternal family. 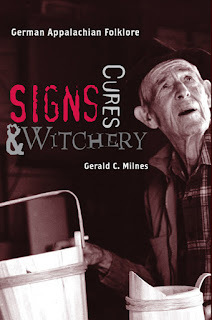 New addition to my library - Signs, Cures, and Witchery: German Appalachian Folklore by Gerald C. Milnes. The persecution of Old World German Protestants and Anabaptists in the seventeenth century-following debilitating wars, the Reformation, and the Inquisition-brought about significant immigration to America. Many of the immigrants, and their progeny, settled in the Appalachian frontier. Here they established a particularly old set of religious beliefs and traditions based on a strong sense of folk spirituality. They practiced astrology, numerology, and other aspects of esoteric thinking and left a legacy that may still be found in Appalachian folklore today. 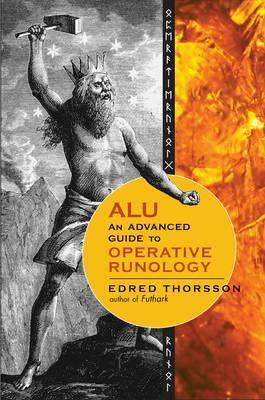 Based in part on the author's extensive collection of oral histories from the remote highlands of West Virginia, Signs, Cures, and Witchery: German Appalachian Folklore describes these various occult practices, symbols, and beliefs; how they evolved within New World religious contexts; how they arrived on the Appalachian frontier; and the prospects of those beliefs continuing in the contemporary world. By concentrating on these inheritances, Gerald C. Milnes draws a larger picture of the German influence on Appalachia. Much has been written about the Anglo-Celtic, Scots-Irish, and English folkways of the Appalachian people, but few studies have addressed their German cultural attributes and sensibilities. Signs, Cures, and Witchery sheds startling light on folk influences from Germany, making it a volume of tremendous value to Appalachian scholars, folklorists, and readers with an interest in Appalachian folklife and German American studies. In Tropical astrological reckoning I am a Capricorn. In Sidereal astrological reckoning I am an Aquarian. In the Hebrew calender (itself based upon the ancient Egyptian mysteries), I was born in the month of Tevet which corresponds to Capricorn/Aquarius. Interesting, is this overlap of Tevet with times part of Capricorn and part of Aquarius. I was there, aware at the Turn and the Dawn of the Ages, as the once-new Age of Capricorn initiated, and as the once-again-new Age of Aquarius initiated. Interestingly, and related to these turns of the Ages, is the fact that in Northern Tradition mythology, my fylgja is a mouse-like creature associated with the beginning and rise of the New Age of Mammals following the end of the Age of the Dinosaurs. The Platonic (Mayan) Age of Capricorn so began, when historical man Homo Sapiens differentiated from his environment and first became 'different' from its homo relatives, like Homo Neanderthalensis. The Platonic Age of Capricorn ended so 130,000 years ago and began the Platonic Age of Aquarius, the latter establishing Homo Sapiens in coexistence with the now different other species of homo and other genuses. Up to this point in time, the Homo Sapiens and the Neanderthals used similar tools, but in the Platonic Aquarian Age, Homo Sapiens improved its technology and sophisticated its awareness of applicable tools. Remembering back before, how can I tell it ... I was there, aware before "historical man Homo Sapiens differentiated from his environment and first became 'different' from its homo relatives." My patroness Hela is Giantess-Goddess. Twelve Platonic Cycles are 311,040 years and 311,040 years ago the DNA-architecture of what was to evolve into Modern Man became inducted by what is mythologically called 'Lemurian Root-Soul-Energy' and also as the 'giants' and the 'Sons of God' impregnating the 'Daughters of Man', say as in your Genesis encodings Genesis.6.2-4. Indeed, even before this, I was there, aware ... my fylgja (a personal aspect of the folksoul) is the mouse-like first mammal to arise following extinction of the dinosaurs. This mouse-like creature is the Ancestor to all mammals living today, including humans. You might now understand that this encoding describes something before the Noahic 'Great Flood' and something after the 'perfect ten Noahic generations' redefined the 'Age of Man' as 120 years from a previous 'longer lived' generation and bounded by Methuselah's 969 years as the 'oldest man' who ever lived. So now some of you may understand the archetype of the 'Great Flood' as the nexus point in the human history, when a previous hominoid evolution became terminated and replaced with a new one. The previous hominoid generation was Homo Erectus culminating in the Lemurian archetype and then continuing in a multifaceted fashion with concurrent homninoids like Homo Neanderthalensis and 'great apes' like Gigantopithecus and after having itself evolved from Homo Habilis and Australopithecine ancestors dating back so 12 Grand Cycles earlier to 12x311,040=3,732,480 years. The mysteries of time, the evolution of consciousness, and the mysteries of the soul are all interwoven. In follow-up to an earlier post where I reported that Saami major mtDNA motherline 2 haplogroup V is also found in my family, and given that both my own U5b haplogroup and haplogroup V are linked together in the Saami, it is interesting to note that both U5b and V are again linked together in a second group - this time in migration with male Y-chromosome haplogroup I1a, which has "been described as the Viking haplogroup." (Y-chromosome) haplogroup, "I1a", which has been described as the "Viking" haplogroup because of its prevalence among men of Nordic extraction. In earlier posts (for example, Saami Major Lineage One Mitochondrial Cluster) I've discussed that my mtDNA ancestral genetic motherline haplogroup U5b1b1 is the foundational lineage (within U5/U5b) of Scandinavian Saami (alternatively, Sami) major motherline 1. Classification of the Sami mtDNA lineages revealed that the majority are clustered in a subset of the European mtDNA pool. The two haplogroups V and U5b dominate, between them accounting for about 89% of the total. This gives the Sami regions the highest level of Haplogroups V and U5b thus far found. Haplogroups H, D5 and Z represent most of the remaining averaged total. Overall 98% of the Sami mtDNA pool is encompassed within haplogroups V, U5b, H, Z, and D5. Although a small proportion of the Haplogroup U (mtDNA) among the Sami falls into U4, the great majority is U5b. The percentage of total Sami mtDNA samples tested by Tambets and her colleagues which were U5b ranged from 56.8% in Norwegian Sami to 26.5% in Swedish Sami. Sami U5b falls into subclade U5b1b1. Haplogroup V is by far the most frequent haplogroup in the Swedish Sami and is present at significantly lower frequencies in Norwegian and Finnish subpopulations. While my own ancestral genetic motherline is U5b1b1 (placing the origins of my ancestral maternal lineage among the Saami), mtDNA haplogroup V (another Saami maternal lineage) is also found among my family members on my maternal side - through my relative Benjamin Franklin who belongs to mtDNA haplogroup V.
Benjamin and John Franklin were brothers, both sons of Josiah. My maternal line relationship to Benjamin Franklin comes down through Benjamin's brother John. My sixth greatfather was the brother of Benjamin Franklin. haplogroup V is by far the most frequent haplogroup in the Swedish Sami. Taken together, the presence of both U5b1b1 and V in members of my family from my mother's side, coupled with the fact that my deep autosomal ancestry (from both parents) localizes to Sweden, makes it even clearer that my "clan" comes from Scandinavia generally, and Sweden more specifically. Spouse: Abiah Foulger in Boston, Suffolk, Mass. Ever have someone tell you that when casting a spell to keep silent about it? Wonder why? Well, what if you are using your will to change some facet of reality (what spellcasting really is), and someone or some ones find out who do not wish that to happen, their will can override yours. Likewise, I'm sure we all know or know about people with exceptionally strong wills who have accomplished their designs despite great forces set against them. Why? Because their will was stronger than the will of those set against them. This is true. To be honest, sometimes I "tell my spells" precisely so that adversaries with strong wills will attempt to thwart my will from manifesting as an exercise to strengthen my magical will. I believe that consciousness and will remain connected to the spells we work (generally, unless "cut off"), so an adversary working against my will gives my will a strengthening workout (by pushing and railing against it), so to speak. I've built up the strength and power of my will in this manner over the years. One easy example of the power of this approach can be seen in the very existence and success of Witchcrafts Artisan Alchemy. Despite that I live in the conservative Midwest bible belt (as opposed to a liberal environment like California) and despite the adversarial opposition my shoppe has encountered from publicly slanderous competitors, Witchcrafts Artisan Alchemy continues to succeed and has grown to become a premier artisan occult shoppe on Etsy. Background - Yesterday I listed for sale at my Etsy shoppe shark teeth and Sahara Sea creature remains from the Eocene Epoch. The start of the Eocene is marked by the emergence of the first modern mammals and lasted from about 56 to 34 million years ago . The dinosaurs were already extinct during the Eocene Epoch, but huge predators still ruled the sea. I also posted on my shoppe Facebook page a video discussing the source of consciousness as hidden and taught in Old Norse myths. In the video, the Nine Daughters of Ægir are also discussed as they pertain to this source of conscious awareness. The emergence of the first primitive mammals (mouse-like creatures) following the extinction of the dinosaurs (during an epoch earlier than the Eocene, namely in the Cretaceous–Paleogene extinction event, often referred to as the Cretaceous–Tertiary extinction event, which occurred approximately 65.5 million years ago) links to my mouse fylgja. Extinction of the dinosaurs is linked by science to extinctions of ocean floor species following asteroid impact. Early this morning, I dreamt a dream of bringing up a giant (jotun) creature from the Ancient Sea. The creature was at once also me. I was on a exploring research ship sailing upon the Dark Sea in a liminal time containing both all time and timelessness. We lowered down a large net into the depths of Dark Sea, seeking to bring up something very important, very ancient, very mysterious. We brought up an ancient cocoon-like liminal-like bubble shell-craft in which an Ancient Creature had been preserved. The Ancient Creature was both a sea creature and me at the same time. As a sea creature, the bubble ship and its content reminded me of a giant clam-like creature. As me, it reminded me of a hibernating human form with all its books and computer gadgets resting in a time capsule cocoon of some sort. It had been brought up to the surface - I felt the creature's "studies" would now reawaken. As one among three couples, we had moved into a long-shaped apartment (brings to mind now a Viking longship), though we all had private living spaces. One of the males of the couples, named Jeff (derived from German Gottfried, meaning "Divine peace"), the companion of one of my "sisters", had been charged to find us our apartment. He had done well. We were all pleased. We were moving into this apartment because of a new research job-study we were all participating in. One of my sisters had the job of being the homemaker. The rest of us had jobs outside of the home. I recall the floors being vacuumed in preparation for our move into the new apartment. My new state of the art high tech computer software was being set up and configured for the research project. During the set-up, I had a bit of difficulty with the number 2 on the touch screen. I had to try several times before touching the number 2 right, getting my touch to strike the screen right to get my entry to take. It "took" on the third try. I woke up. I also listed a few specimens (here and here) of copal amber from Madagascar yesterday on my Etsy shoppe. During my last ritual blot (Haustblot), I had placed my own more ancient fossilized amber with fossil inclusions on my harrow in honor of Freyja. The Source of Awareness and the Fire from Within - Hidden Knowledge in Old Norse myths. Compares hidden realities revealed in Old Norse Myths with mysteries as discussed in the works of Carlos Castaneda. A little over half way through the video linked below (embedding disabled), it discusses Heimdallr as the "Living Universe", which is very relevant to my own experience of the mysteries when I was 5 or 6. Given my own ancestral genetic U5 motherline is connected to the indigenous hunter-gatherers of Scandinavia (as discussed in earlier posts here and here) who have been in Europe for nearly 50,000 years, and that this population seems to be associated with the Vanir, while Odin is connected to Aesir (and possibly to the population who came into Europe about 25,000 years ago bringing ancestral genetic motherline haplogroup H with them), it seems even more likely that I took my mystical space-worlds-journey when I was a child with Heimdallr, a deity with origins in the Vanir by many, and the one who "guards" the Bifrost Bridge. I am seriously considering that Heimdallr is a patron deity to me. In follow-up to my earlier post which compares my general mtDNA haplogroup (namely, U5, the oldest and indigenous haplogoup in Europe) with the predominant mtDNA haplogroup in Europe today, namely H, this post will examine possible factors which influenced the growth and expansion of haplogroup H.
The Neolithic agricultural (farming) revolution began about 12,000 years ago, so the H-haplogroup migration wave which came into Europe 20-25,000 years ago would not have been of a farmer culture. The H-wave migration consisted also of hunter-gatherers coming from West Asia (in the literature) into the areas populated by the indigenous U5 tribes. Most researchers agree that social hierarchies began with the advent of farming. The earliest known farming communities are found in the Near East, dating back almost 11,000 years. Archaeologists have looked for evidence of social stratification in these societies with mixed results. Some early farming societies show signs that people played different roles and that some were buried with greater ritual—shuffling off this mortal coil with a number of elaborate "grave goods," including pottery and stone tools. However, there is little evidence that social inequality was hereditary or rigidly defined. That seems to have changed sometime after farmers moved into Europe from the Near East, beginning about 8500 years ago during a period known as the European Neolithic. One of the best studied farming cultures is the Linearbandkeramik (LBK), which arose in what is today Hungary about 7500 years ago ... LBK societies were "patrilocal," meaning that males tended to stay put in one place while females moved in from other areas to mate with them (which may explain why mtDNA haplogroup H is the predominant ancestral motherline in Europe). A number of recent genetic studies have shown similar patterns among early European farmers. "The signatures from these skeletons reinforce other indications of male-dominated descent and even land inheritance," Bentley says, adding that such social inequalities "only grew in extent and scale" over the course of history." To read more, click link. So, the growth and extent of haplogroup H in Europe may be closely correlated with the dynamics and spread of farming communities throughout Europe. Though my very specific U5b1b1* subclade markers localized my own deep genetic ancestral motherline root to Sweden, the chart in this link at Eupedia (Distribution of European mitochondrial DNA (mtDNA) haplogroups by region in percentage) shows that, generally, the broader U and U5 mtDNA haplogroups (both to which my own subclade belongs) both have their highest distribution frequency in Finland. Haplogroup H was carried to Europe by migrations c. 20-25,000 years ago, with several independent studies concluding that haplogroup H probably evolved in West Asia c. 30,000 years ago. These 3 predominantly haplogroup U regions represent the extant indigenous peoples of Russia (of the Caucasus and Volga-Ural regions) as well. Haplogroup U is estimated to have lived in the Near East or Southwest Asia some 55,000 years ago, about 15,000 years after modern humans expanded out of Africa. U5 probably expanded into Europe with the first modern humans some 47,000 years ago. So, the working timeline among scientists is that U5 was present in Europe by around 47,000 years ago (coming from the Near East/Middle East/Anatolia through Russia), while haplogroup H came into Europe about 20-25,000 years ago (from West Asia which includes the Near/Middle East). For those of you following my ancestor work ~ Through my ancestral genetic motherline (U5b1b1*), I can trace my maternal ancestors clear back to the earliest hunter-gatherers in Northern Europe. A rare haplogroup in Europe generally, haplogroup U5 has roots in earliest prehistoric Palaeololithic Europe. Clan Ursula (general haplogroup U5) - the ancestral motherline Clan to which I belong - is the oldest surviving genetic motherline haplogroup in Europe. As the ice began to retreat about 15,000 years ago, haplogroup U5 was among the first people to repopulate central and northern Europe. We know this because U5 is the dominant haplogroup in ancient remains of early hunter-gatherer populations in Europe, with U5 and its sister group U4 representing about 90% of the earliest hunter-gatherers. U5 was largely replaced by early farmers and other Neolithic immigrants to Europe and currently U5 represents only about 11% of European mtDNA. Some very old subclades of U5 are extremely rare, perhaps because they represent the remnants of hunter-gatherers that were largely replaced. Read more at link above. What this means is that my ancestral motherline hails from the indigenous native population of Scandinavia. In follow-up to my previous two posts (here and here), Gollveig is an earlier name for Heid (also written Heith). Heid is my Teutonic sacred name. Oft and again, | yet ever she lives. To evil women | a joy she was. And the field by the warlike | Wanes was trodden. [21. This follows stanza 20 in Regius; in the Hauksbok version stanzas 25, 26, 27, 40, and 41 come between stanzas 20 and 21. Editors have attempted all sorts of rearrangements. The war: the first war was that between the gods and the Wanes. The cult of the Wanes (Vanir) seems to have originated among the seafaring folk of the Baltic and the southern shores of the North Sea, and to have spread thence into Norway in opposition to the worship of the older gods; hence the "war." Finally the two types of divinities were worshipped in common; hence the treaty which ended the war with the exchange of hostages. Chief among the Wanes were Njorth and his children, Freyr and Freyja, all of whom became conspicuous among the gods. Beyond this we know little of the Wanes, who seem originally to have been water-deities. I remember: the manuscripts have "she remembers," but the Volva is apparently still speaking of her own memories, as in stanza 2. Gollveig ("Gold-Might"): apparently the first of the Wanes to come among the gods, her ill treatment being the immediate cause of the war. Müllenhoff maintains that Gollveig is another name for Freyja. Lines 5-6, one or both of them probably interpolated, seem to symbolize the refining of gold by fire. Hor ("The High One"): Othin. [23. This stanza describes the battle and the victory of the Wanes, after which the gods took council, debating whether to pay tribute to the victors, or to admit them, as was finally done, to equal rights of worship. This is simply stunning. I'm in that moment when you know you are where you are supposed to be. This is my story! All of these years and decades I've searched for it, and here it is! Gollveig means Gold-might. In some traditions, gold symbolizes harsh judgment. So, the bifurcation discussed in my previous post here could be a separation of ancestral might from the force-quality of harsh judgment. This actually fits very well with my memory as described in the "bloody" poem. I'll have to look at what the runes have to say about these particular arrangement of letters in the name Gollveig. My genetic motherline is U5b1b1 (actually U5b1b1* which has extra nucleotide transitions than the plain U5b1b1, and also has the same backmutation as Saami-specific motif U5b1b1a) with my deep autosomal ancestral genetic root in Sweden. I also have genetic match-connections to Baltic Estonia, Latvia, Lithuania and Finland (as well as North Sea Norway, England, Ireland, Scotland etc), so this fits too. In follow-up to my previous post, the poem below is a pre-incarnate memory that I've posted before. The commentary which follows this poem is new and discusses this poem in contrast to the experiences discussed in my previous post. The memories I am referring to in the previous post (PP) are distinct from the one in this poem. The memories I am discussing in the PP do not include this particular memory. I have so many memories. The "person" in this memory as described above is not the same as the "person" in the PP set of memories. In this memory, I was not seeing the outline of my future life (as I was in the PP). In this memory, I was seeing the prehistory of life on earth and the violent conditions which existed on earth. In this poem, the "other person" and I were "part of the same body" sort of, but we were "cut apart" and separated. There was no communication between us (though I tried to communicate) and neither one of us could face the other - we were like standing stone and unable to move (the symbolism of this kind of memory should not be taken literally, as these memories pertain to premanifest forms). This "person" was removed from me forever, so I am thinking that this particular memory may represent a divergent bifurcation in my ancestral line. This memory preceded the ones I wrote of in the PP. This may also be why I felt that "some things can never be fixed," because the ancestral line (to which we both belonged at this point) bifurcated, and I went one way, and the other "person" went a separate way. Especially since in this memory I was seeing violent prehistoric events upon the earth (and since my fylgja is a mouse-like creature ancestral to all mammals), it may even be that this represents the ancestral "line divergence" between homo sapiens and another archaic human species from our common ancestor. Interestingly, this divergence which "can never be fixed" is supported by my own ancestral genetic testing results - genetic scientists claim that all non-African modern humans carry between 1-4% Neanderthal DNA in our genome. However, when I uploaded my autosomal DNA data to an analytic tool which analyzes one's Neanderthal genomic percentage, my genomic results came back with 0% Neanderthal admixture. In the PP, the person and I were not part of the "same body" though we shared the same bubble of being. In the bubble of being, we could move and communicate. The "person" in PP is not the same as the "person" in the poem above. this (chromosome 2) fusion event took place long before modern humans arose at around 200,000 years ago. Indeed, the 800,000 years ago date for the last human - Denisovan common ancestor means that this is the most recent date possible for the fusion. so, it may be that the archaic human species in my memory is not Neanderthal, but some other archaic species - the Denisovans perhaps, and the bifurcation marks the split from the common ancestor Modern Humans shared with the Denisovans (or even marks the fusion event split from an earlier hominid species, or even a series of splits (as the violent blooding "was climbing up (the tree of knowledge-Yggdrasil) to where I was watching) - there are many possibilities. It is conceivable then, given that both Modern Humans and (at least some of) the Denisovans share a fused chromosome 2 that interbreeding could have occurred between Modern Humans and this particular archaic human species. There is a genetic test which checks for Denisovan genes, but I haven't been able to find an online analysis tool (which allows uploading of raw genetic data) to check that hypothesis out on myself and I haven't had the upgraded Geno 2.0 tests which checks for it either. I am inclined to believe that the memory in the poem above is the memory of a series of splits that have occurred since the very origins of my biologic ancestral line. But, there is even more to this story ... next post. I've written of this particular experience many times before, but in this post I will add some new descriptive and analytic commentary into the mix. The experience (described poetically below) had nothing immediately proximal to it to do with ancestral memories or past lives. It may describe contact with my fylgja, a masculine divine psychopomp, my masculine "soul mate" (Lífþrasir) and/or a masculine kinfylgja. Basic Description of the Experience. A bit preceding and for time a bit after my birth, I was "accompanied by a kin-being with consciousness that can be described as a force without form. In earlier parts of my journey, he was just a voice calling me - a voice that in trying to locate it's source, and in following the sound of his voice, led me toward physical incarnation. It was a masculine voice, but I don't feel that he was my fetch. This kin-being was the force who "formed my physical form" for me to incarnate into, however (which seems somewhat fetch-like, yet ...that word just doesn't capture the fullness of his relationship to me). I'm not satisfied that this being was my fetch (fylgja). It was not "self" in the sense that I would expect the fetch to feel like. It felt more "kin-self", like a distinct part of me (as a fetch might be), yet very distinct from me - we were each unique beings of consciousness, yet at this point in my journey, we were still joined like two bubbles within one bubble of being (not literally a bubble, but this is the closest word I can think of to describe the relationship of consciousness).When I became born, my bubble was more distinctly me, while his bubble became more distinctly him apart from me - his bubble remained in the otherworld (although our singular bubbles are still even today joined by the bubble we share), and for a time, his voice could reach into my own bubble in this world, and likewise mine could reach into the otherworld into his (and thus, we could still communicate and have conversation). Also, I should mention, that we had very involved conversations for a period of time surrounding the events leading up to my birth and during early childhood - the relevance of this is that we didn't speak together in language as I learned it as a child of this world. We spoke in a pre-verbal language of pure meaning innate to the soul-being that I am - a language I didn't need to learn, it is a language perhaps directly partaking of elements innate to the soul. It almost seems that the more I learned to "talk with my tongue" and "hear with my ears", the less able I became to talk and hear through to the otherworld. I did for a very short time, talk with my tongue and hear with my hears, in conversation with him, but I feel this was gift for me that normally wasn't given, because I was being made to remember. My Wyrd Ancestral Hamingja - Being Prepared to Receive It. During the pre-incarnate portion of this experience, I wasn't seeing a "past life" pass before my eyes, I was seeing the general outline of my "future incarnate life" - of what was going to come and that is why I did not want to be born, I saw that my life would be very hard. Though I was seeing the general outline of my fate, the force with me was not preparing to detach anything - on the contrary, I was being prepared to receive what was being prepared for me (there is a different focus), and this force explicitly communicated that he would always be with me and instructed me to "remember!" the Hafskjold Stav tradition considers the Fylgya to be like an animal spirit guide. Tradition further teaches that the fylgja may be "the conduit through which we speak to the gods" - like the point of interface which brings the person and the deity together (like - hello, this is the operator, I have a call for you, please stay on the line). Additionally, this force stayed near to my in consciousness well into childhood - and though I could not "turn around" in incarnated consciousness and leave the sphere of this world as child like I could as a newborn baby before becoming solidified into my body to speak with the force, I could call upon and speak to the force in the sphere of this world. I could easily hear his voice even though I could not "see" him as before becoming solidly incarnated. The Shamanic Psychopomp & the Tree of Knowledge. Unlike a fylgja, importantly, when I was 5 or 6 years old, this force returned more directly and took me consciously in spirit (awake, not a dream!) on a journey throughout the worlds to the very edges of All that is - passing many noisy planets, cosmic systems and through vast stretches of the cosmos to its very end. During this journey I was shown everything and was able to comprehend how the deepest mysteries all fit together perfectly - all questions evaporated, complete knowledge was the very essence of my being. This experience is not the fylgja. It is Odin (or a similar divine masculine shamanic psychopomp like Heimdallr*, for example) who is with me, even now. In the poems below describing my childhood experience, I do think it may have been my fylgja who caught my attention "for Odin" through the mouse in the mousetrap (as the Fylgja is also the conduit through which we speak to the gods), but beyond that point with the mouse, it wasn't. Sometimes I wonder what happened to my body when nothing much of me at all was in it during this experience, even though I did remain attached to it through some kind of very thin structure which I used to contract myself upon and slide back down into my body when returning from the journey. Oddly, it took a little time to come fully down, and didn't complete until after I got up, left the closet, and was standing in my bedroom. In my bedroom, my conversation with my companion on the journey continued for awhile, but after this experience, I never heard his voice again like I had been able to all through childhood. But during this conversation, he did tell me he was holding (in safekeeping) the knowledge for me (as the knowledge would not fit into my biological mind at that point) for use at some "appointed time" in the telling of my story. I was promised it would be mine again - it belongs to me, it has my name on it. But, in oath he is holding for me like keeping it in a trust fund until the appointed "time" arrives. My Ancestor - The First (Mousey) Mammal. I'm not an expert regarding an egregore, so I'm not sure what it really is other than a collective thought-form made manifest. With this understanding in mind, my experience was not contact with an egregore. No humanoid form of any kind was associated with this being during this experience (or has ever been in my experience). It was humanoid only in the sense that he was "a he" in the same way I am "a she". We were both made of the same "stuff." A thought-form lacks the complexity of being that characterizes "the stuff" human beings are made of. Neither did I experience an "astral vision." My experience was one of action, not mere sight. My complete consciousness left my body and was pulled up into the very heart of the Cosmos by the familiar masculine "personality" known to me from before I was born and who had been experientially "with me" all through early childhood. This being had independent will and was spiritually cohesive similar to that of a "person." I'm not a psychologist, but I imagine that an egregore, being the thoughtform construct of a collective would be a bit on the incohesive side (given the multiplicity and diversity of the people who construct the thoughtform) and not as psychologically cohesive as an entity existing as a being in its own right. Cycles of Ragnarok - The Connections. The Odin Brotherhood: According to the legends, one man and one woman will escape the holocaust of Surt by taking refuge in "The-World-Tree-of-Knowledge." The fact that the mouse in my experience can link to the rising up of the common ancestor of all mammals (after the extinction of the dinosaurs) is wyrdly congruent with the concept of Ragnarok as well, as both the extinction of the dinosaurs and Ragnarok mark grand turnings of the cycle of evolution - the end of one era and the beginning of a new one. Space: the final frontier. These are the voyages of the starship Enterprise. Its five-year mission: to explore strange new worlds, to seek out new life and new civilizations, to boldly go where no (wo)man has gone before.